Die Linke's Oskar Lafontaine on "anti-systemic" parties and how to forge a democratic Europe. Oskar Lafontaine is one of postwar Germany’s most remarkable politicians. Only former social-democratic Chancellor Willy Brandt provoked similarly emotional responses. Yet ever since moving towards socialism a couple decades ago, Lafontaine has become an even more polarizing and controversial figure than Brandt. The former champion of European Union integration and sympathizer with the “post-material movements” of the 1980s is now one of the most vocal critics of Europe and staunchest defenders of the welfare state. In his long career, Lafontaine served as minister-president of the tiny state of the Saar on the French-German border; mayor of its capital, Saarbrücken; German secretary of finance; chairman of the Social Democratic Party (SDP); and later cochair of the new left-wing party Die Linke (The Left). In the late 1990s, the English tabloid the Sun called him the “most dangerous man in Europe” for advocating the regulation of financial transactions at the European level. Following a well-orchestrated media campaign and losing ground to the neoliberal forces in the German Social Democratic Party (SPD) around chancellor Gerhard Schröder, Lafontaine resigned from all his posts, prompting the German stock markets to rise by five percent. In 2005, Lafontaine left the SPD after four decades and joined the new Die Linke formation. Under his leadership, the party grew electorally. But Lafontaine came under attack again, this time from the government-oriented wing of Die Linke, who saw in Lafontaine a barrier to forming future coalitions with the SPD and the Greens. After battling cancer, Lafontaine resigned from the party’s leadership in 2010, but still leads the organization in Saar. Following the outbreak of the eurozone crisis, Lafontaine emerged as a critic of the euro, advocating the abolition of the single currency and a return to a system of coordinated exchange rates. A charismatic speaker, Lafontaine quotes a variety of sources in his speeches, from French socialist Jean Jaurés and German revolutionary Karl Liebknecht to Pope Francis. Here, in an interview that has been edited for clarity, he speaks to Cologne activist Leandros Fischer about a democratic Europe, how to express solidarity with Syriza, and Die Linke’s position as an “anti-systemic” party. Two years ago, in the aftermath of the Cyprus “bail-in,” you created some stir by calling for abandoning the euro and a return to a system of coordinated exchange rates. Do you still support this position, and if so, why? The current euro system is not working. We’re not just talking about a currency, but about a system determined by the conditions of the Maastricht Treaty. That is why I support introducing more flexibility into this euro system. To be more precise, this means that it would be sensible to introduce a sort of “Greek euro,” whose exchange rate must be decided among others by the European Central Bank [ECB] in order to prevent a rough landing caused by the devaluation of this new currency. This shows that we’re not talking about a Greek exit from the euro system but a continuation of Greece’s membership in this system, but under more favorable terms. The response from other prominent members of your party was swift: Die Linke supports the common currency, the fault lies with the policies of German Chancellor Angela Merkel. Some even accused you of trying to curry favor with voters of the right-wing populist AfD. In an interview with the Tagesspiegel , Greek economist Costas Lapavitsas stated that the reason why a large part of the European left supports the euro has to do with the influence of ideology, in this case Europeanism, i.e. the idea of the existence of a common European demos. Back in your time in the SPD you always stood out as a supporter of deepening European integration. What is the vision of a known euro critic as yourself, for a more just and social Europe? To what extent should this involve reforming or transcending the current European institutions? The vision remains a democratic and social Europe. But if we see democracy in Greece being hollowed out, due to supposed financial constraints, then one has to dismantle these supposed financial constraints. The reactions within the Left and other parties, which you mentioned, can be traced back to the fact that there isn’t any understanding of the function of currency systems, as there was no understanding of the German monetary union back in 1990. During the introduction of the euro, nobody seemed to understand the necessity of a common wage policy, as nobody seemed to understand my opinion that without coordinating wage policy, this system will be unable to function. But this has a long political tradition in Europe. But how can a Grexit be linked to new internationalist project European unification? By way of the ECB participating in this as a European institution, which is democratically accountable — something currently not the case. Your close associate Heiner Flassbeck coauthored with Costas Lapavitsas an exit strategy from the euro for Cyprus in 2013. Reading it, it struck me as an alternative Keynesian growth strategy. My question — and I think a lot of people are asking this — can there really be a solution by means of a controlled exit amidst this deep structural crisis of capitalism? In other words, are proposals like these a means by themselves, i.e. growth, or a way to an alternative program of reorganizing society along social lines? They’re both. The introduction of a parallel currency would of course offer the country in question much more room to maneuver and more economic competence, which must be democratically accountable. This is one thing. Now we have the disastrous situation of a powerless Greek government that has to, more or less helplessly, watch as other forces dictate conditions on it. Of course, this new flexibility by a “Greek euro” is by no means a guarantee for an immediate re-industrialization, but the Greek economy or any given economy would definitely receive room to breathe. Experience teaches us what’s economically best. Experience shows us in this case that a currency system which forbids devaluation cannot function without wage coordination. In the eurozone, we had real wages in Greece which were above the productivity level, but more importantly, we had a situation where the Germans were systemically practicing wage dumping. Under these conditions, a breakdown of this system was inevitable. How do you see Syriza’s historic election victory having an impact on the (arguably more difficult) fight against neoliberalism in Germany? Is it giving expression to a more articulated form of discontent with Angela Merkel’s crisis regime at home? Is it provoking rifts within the SPD and the Greens, as some claim, therefore enabling a possible “red-red-green” coalition in 2017? Does the SPD also run the risk of “Pasokification”? Of course, Syriza’s victory is a source of hope for the European left. Die Linke also knows under which dire conditions this government has to function. It’s a project with an open ending but it’s hope nevertheless. And this hope is grounded on the will of the Greek people, which rejected neoliberal policies. The question if the SPD and the Greens have learned from the mistakes of the past has to be answered “no.” These parties still support the Stability Pact, which is the main expression of the diktat of austerity in Europe today. So it’s better not to color anything a color which it isn’t [laughs]. The main questions is if Die Linke can work together with forces that back austerity, and this is something I categorically rule out. How far do you think the German government will go in attacking Syriza? Do they want to “get rid of the Greeks” and expel them from the euro, or do they essentially want to force them to implement austerity and therefore keep them inside “the iron cage”? There are mixed signals regarding that. There are reports that German Finance Minister Wolfgang Schäuble had argued for a Grexit in 2012. There are, on the other hand, official statements saying that a Greek exit from the eurozone can have unforeseen consequences. In this respect, the German government is vacillating on this issue. I personally believe that Merkel and Schäuble don’t know how the currency system works because they remain attached to the neoliberal dogma that says that wage cuts, job slashing, and austerity can promote growth. Die Linke voted overwhelmingly (with some notable exceptions, like Sahra Wagenknecht) for ratifying the deal reached by the new Greek government and the Eurogroup a few weeks ago. A main argument was fear of appearing not to be in solidarity with the government headed by Alexis Tsipras. How do you judge this position? The fear of appearing not in solidarity with the new Greek government is something which I deeply understand. But it is nevertheless a fear which is more grounded on distorted perceptions than on real facts. In reality, this was a proposal by the German government for extending credit to Greece under harsh conditions. I personally pleaded for abstaining in order to avoid two public misunderstandings. On the one hand that we’re not standing by Syriza, on the other hand that we’re favoring the diktat of austerity. Our solidarity with Syriza consists in our rejection of the German government’s austerity packages for Greece — we are the only party to do that — and our criticism of the German government for its failed policies in this respect. Die Linke’s parliament group was in a dilemma because of these distorted perceptions of reality, but this does not alter our position of solidarity. On the other hand, twenty thousand people, mostly but not exclusively Germans, demonstrated earlier this month against the opening of the new ECB building in Frankfurt, “the heart of the European crisis regime.” Given the frustratingly low state of social protest in Germany, do you see this as a sign of renewed social movement activity in the country? That would indeed be something to wish for. Nevertheless I’m aware of how difficult it is to maintain protest movements. I see the main problem in the different effects of austerity policies in the various European countries. In Germany, these effects are comparatively milder, despite the fact that Germany has a large low-wage sector and old-age poverty. Old-age poverty is something not many people see yet, whereas many people have gotten used to the low-wage sector. Where the effects of the crisis were stronger, we thankfully had a breakdown of the political system, which was necessary, because only neoliberal parties have been in power throughout Europe so far. Die Linke is now a decade old. When it first started, it stood out as the main voice of protest at the evolution of market social democracy, incorporating many themes from the alter-globalization movements. At its birth it counted on important allies in France (the movement against the EU constitution), Italy (Rifondazione Comunista), the UK (RESPECT), and elsewhere. Ten years later the left in those countries has been swept away by a wave of right-wing populism, in some case preceded by a left-wing participation in center-left government like in Italy. Die Linke seems to hold its ground electorally, though it doesn’t appear to be the main benefactor of discontent with the established political system. If anything, the election of a left-wing state chancellor in Thuringia seems to be paving the way for a more “pragmatic” stance on Die Linke’s two key defining positions, anti-neoliberalism and foreign military intervention. 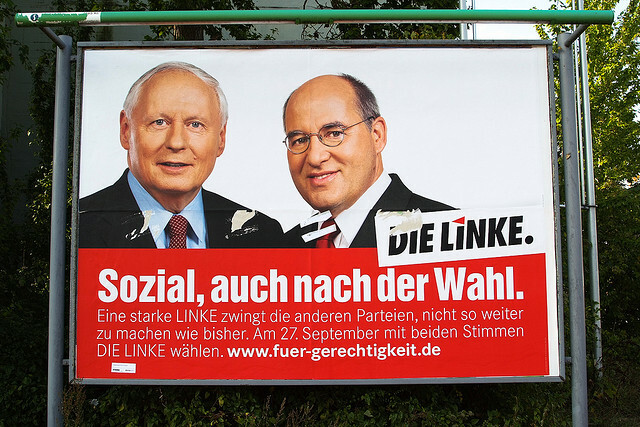 Popular distrust at established political parties is also affecting Die Linke. What seems to explain why formations such as Die Linke and the Front de Gauche appear to have reached a glass ceiling in terms of elections, whilst Syriza and Podemos have had more spectacular success? These are many questions [laughs]. Let’s start with the question of participation in government. This is only acceptable if it delivers change for the voters, which is experienced by them as such. This was Rifondazione’s mistake in Italy, which failed to do exactly that, and it was punished for this by the electorate. This is something every left party will experience if it repeats the mistakes of the past. It’s something which anybody can easily recognize by studying the history of the family of left parties in Europe. A distinction has to be made in Germany between the state level and the federal level. Issues pertaining to antimilitarism, foreign policy, taxing policy, etc. are not under discussion there. There’s the issue of the federal law regarding the break of debt for local governments . . . Yes, this is written in the constitution now and if you participate in local government, you have to abide by that. By my position regarding participation in government on the national level is that this is only permissible if there are concrete and recognizable improvements for people’s lives. In the case of Germany, this means improvements in the areas of unemployment and pension insurance, wage policy, and of course no foreign interventions. But the question of government will be irrelevant in Germany due to the development of the SPD. The SPD finds itself in a phase of unprecedented weakness. Which role the Left can play can be witnessed in Spain and Greece, even though we are talking about open processes. When pressure within society becomes very strong, Die Linke only has a chance if it acts credibly. That’s the reason it was founded. We said that we have four neoliberal parties in Germany and almost exclusively neoliberal parties in government throughout Europe, and this is why we need to offer an alternative. And in Germany, it is obvious that the Right in the form of the AfD is no alternative. It supports all neoliberal positions. Its president, Bernd Lucke, was always one of the intellectual supporters of wage dumping. There is a real difference between the political left and the political right. There seems to be not just a fatigue with the current economic system, but also a fatigue with political parties as such. Die Linke has undergone a process of institutionalization in the last ten years, and it’s safe to say that it is not often the first address for people expressing discontent at the current order of things. I mentioned Syriza and Podemos earlier because these forces managed to flourish by presenting themselves as an alternative to established politics. If a red-red-green coalition government is out of the question, what is the way forward for Die Linke? How can it initiate an effect of politicization? This is something very difficult because the social system under which we live, the capitalist system, is a very entrenched one. It is designed in such a way that the economically powerful preside over all political decisions. Representative democracies are not democracies in the actual sense of the term. We know since Pericles that democracies are social systems which serve the interests of the majority, and there can be no talk of democracy anywhere in Europe. Die Linke has in this sense only a reason to exist if it becomes — or remains — an anti-systemic party, and is perceived as one. Being anti-systemic means consistently advocating a society in which social life is reorganized, where the fruits of labor go to those who have earned them. It also means recognizing that past socialist endeavors have failed because they were undemocratic and centralized. In this sense, another path has to be chosen. In my opinion, it is the path of employee-managed enterprises in which democracy flows to everyday life and not a society in which feudalism rules over economic life. Because where there are billionaires, there is no democracy. No person can earn a billion. A billionaire contradicts the basic Enlightenment idea that wealth is the result of labor. Are you optimistic about the development of Die Linke? I don’t know if “optimism” can answer this question. Concerning the power structure, we have a very entrenched social system. Interestingly, not even the financial crisis has changed that, although anybody can see after the financial crash that Wall Street runs the US, not Congress or the president. The oligarchic systems in Ukraine or Russia, for example, show us that we are witnessing a regression on a global level and a rollback of modest social progress over the decades. And yet I’m convinced that Die Linke has no other option than to go against the current and to present alternatives. It has to stay programmatically consistent, and this means not going down the road of accommodation. If it does that it will simply be swallowed by the system. It has to go the way of consistently advocating a different social model. Racism in all its manifestations is on the rise in Europe, especially in the form of Islamophobia (a kind of “respectable” racism). What explains this spread even to layers of society previously unaffected by it? I believe it has to do with the fear of relegation on the social scale. When these fears, combined with fear of marginalization are present, this leads to certain social layers responding with the marginalization of others. All historical experiences show us that these fears result in the marginalization of others. A final question. It would be an understatement to say that supporters of Die Linke would like to see you playing a more active role in the leadership of the party again. Your career was marked by a series of surprises. Are you planning a comeback? [Laughs] I do my part by participating more frequently on public debates on television, by doing more public appearances . . . Hence the question . . .
Special thanks to Loren Balhorn, Sebastian Budgen, Stathis Kouvelakis, and Oliver Nachtwey. Oskar Lafontaine, the former cochair of Die Linke, now leads the organization in Saar.